We purchase the oak for our Hoosier cabinets from a small, one man saw mill located in Mio, Michigan about 35 miles north of our home. The saw mill is located just north of Mio in a quaint Amish community filled with farms, lumber companies, and one room school houses. Our lumber supplier Jim Yoder, purchases whole logs from the local loggers, mills it into boards and then kiln dries the wood in solar powered kilns. 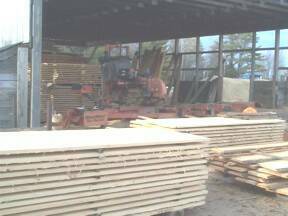 After reaching the proper moisture content, the lumber is surfaced (planed) and is ready for pick up. 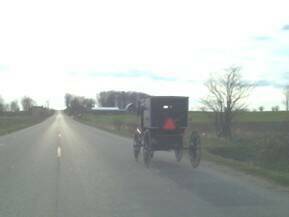 Passing an Amish buggy on our way to purchase oak for Hoosier Cabinets. Freshly cut wood at the sawmill. Note the bandsaw mill in the background. 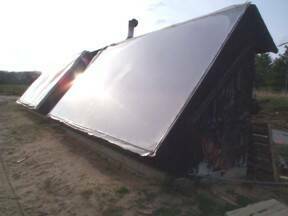 Solar kilns used to dry the wood for our Hoosier cabinets. The cabinets built in this article were ordered by: Sandee V. of Green River, WY. and Yona D. of Westmount Quebec. Thank you for your orders!